Will Harvey is a London-based violinist and is the co-founder and Managing Director of Parallax Orchestra. He also regularly writes arrangements for the group. Will was a founding member of UK rock band 'Dry the River' (RCA Records) and played around 500 shows with them between 2009-2014. He was a co-composer and arranger on the critically-acclaimed album 'Shallow Bed' (2012). After parting ways with the band he completed a master's degree in violin at Trinity Laban Conservatoire of Music & Dance, passing with distinction. Since then he has toured with The Royal Philharmonic Concert Orchestra as co-principal 2nd violin, English Touring Opera and numerous freelance orchestras. He works closely with up-and-coming artist Dodie, is in the touring lineup of The Irrepressibles and has toured and performed as a session player with numerous bands in many different genres. He is a regular recording artist, studio arranger and session MD. As well as music, he is passionate about helping fellow musicians protect their hearing and has been a Music Ambassador at Hearology since 2016. Maddie is a cellist and co-founder and co-administrator of Parallax Orchestra. Maddie studied the cello at the Guildhall School of Music & Drama with Pierre Doumenge, graduating in 2016. 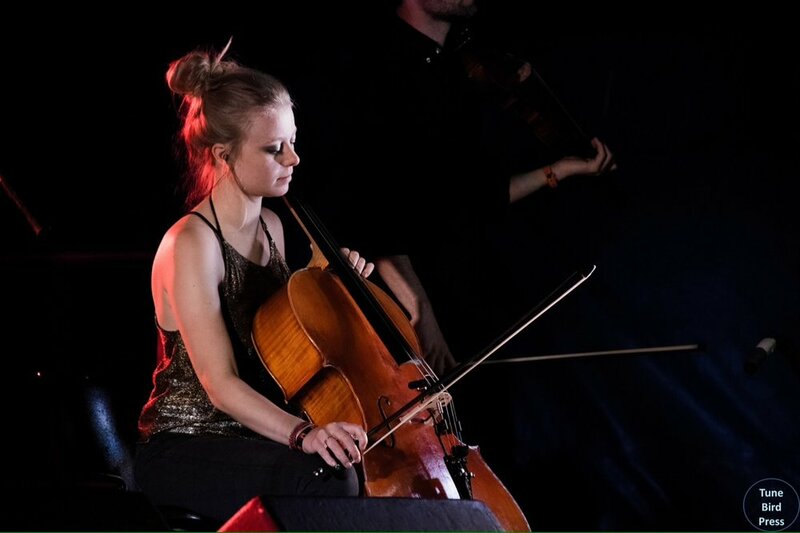 She has quickly gained a reputation as a collaborative and versatile cellist, performing live and recording alongside a variety of bands such as Anna Meredith, MONEY, Shells, Bring Me The Horizon and Deaf Havana. Her ability to improvise, and appreciation for music from other cultures, has led her to work with musicians such as Kadialy Kouyate (kora player) and Jasdeep Singh Degun (sitar). Maddie also enjoys a career as a theatre musician at Shakespeare’s Globe Theatre, and recently performed in Howard Moody’s opera ‘PUSH’ (commissioned for Battle Festival), in collaboration with Glyndebourne. Simon Dobson is a trumpet player, composer, producer and principal conductor of the Parallax Orchestra. As well as conducting and working as an MD internationally, he is a critically-acclaimed and widely-performed composer and a recipient of two British Composer Awards for his works 'Symphony of Colours' and 'Journey of the Lone Wolf'. In 2014 he wrote his first full-length film score 'The Battles of The Coronel and the Falkland Islands' which was commissioned by the British Film Institute and received its premiere with fully-restored film in the Archive gala concert of the London Film Festival at the Queen Elizabeth Hall. As a founding member of the session horn crew Badcore Horns, Dobson has performed as a trumpeter on over thirty albums to date, from Madness and Martha Reeves to Dry the River and We are the Ocean. He recently toured with London hip-hop band Lazy Habits and is currently the trumpeter of the Plymouth band Antimatador. In addition to his composition and performance work, Dobson is a regular studio arranger and has written strings for numerous records. In 2015 Dobson released his first solo composition album entitled 'Euneirophrenia' which contains the first brass band test piece to be printed to vinyl in nearly 30 years.